If you own your own commercial property here in the Jacksonville area, you may think of commercial landscaping as a necessary evil. Unlike residential properties, an office building or store is a place of business, not a place people live. This means that they often tend to be more sparing when it comes to commercial landscaping. Shouldn’t healthy grass and a few trees in the parking lot be enough? As your commercial landscaping experts in Jacksonville, we think there are a few very good reasons to consider a more sophisticated landscaping design. Like an outdoor patio or courtyard area, perhaps? Here are three ways that using our landscaping services at your commercial property could be good for business. The Look Of Success – Commercial landscaping makes your company look more professional, whether you’re a digital marketing firm or a restaurant. People interpret commercial landscaping as a sign of success and they’ll be more likely to consider working with you. Attract Customers – What can we say? Success is attractive! When you have a beautiful outdoor patio that people can see from the street, it will draw them into your establishment. Give Your Employees An Outdoor Break Room – Studies have shown that spending time outdoors relieves stress, sharpens thinking, boosts creativity, and makes employees feel more satisfied with their job. 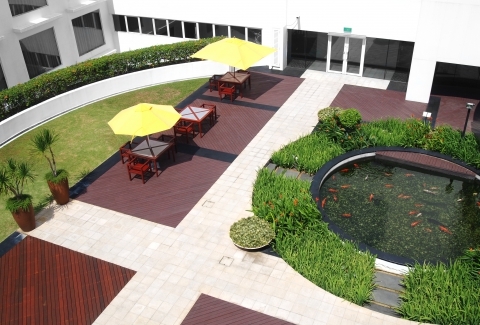 A beautiful outdoor patio can serve as a place for employees to recharge during their lunch hour. Want to learn more about what it would take to add a patio to your professional building? Contact the commercial landscaping team at C&L Landscape Inc. in Jacksonville today.